I've been doing some kayaking but forgetting to share and archive data. First, I went to the Fulton chain lakes near Old Forge with Lauren. We had a campsite right on Eighth Lake and cruised around it twice. I checked out Seventh Lake once on my own, but my phone died before I got back. This lake was populated with some really nice houses to the southwest. A seaplane almost landed on me. Finally, I went back to Harriman Reservoir yet again and totally exhausted myself by paddling almost 20 miles. Once again my phone died. I think sometimes the camera stays active when I don't intend it, which drains the battery. No pretty pictures this time. They're all majestic lakes surrounded by rolling hills and mountains. Nobody wants to see that. 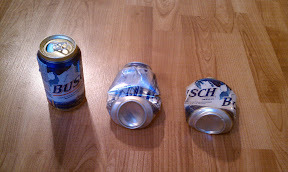 Finally, I started playing a new game: I found and was able to retrieve three cans from the bottom of Harriman Reservoir. 2011-08-14 1444.csv​ (62.8 KB) - added by Cory McWilliams 8 years ago. 2011-08-16 0941.csv​ (104.9 KB) - added by Cory McWilliams 8 years ago. 2011-08-16 1200.csv​ (123.2 KB) - added by Cory McWilliams 8 years ago. 2011-08-26 1055.csv​ (484.5 KB) - added by Cory McWilliams 8 years ago.